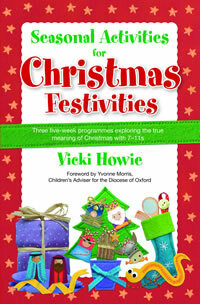 Three five-week programmes exploring the true meaning of Christmas with 7-11s. Each programme contains five sessions that fit readily into the autumn half-term leading up to Christmas, and includes an optional short presentation for a Christmas service or assembly. Choose from three themes, each unpacked through icebreakers, discussions, games, crafts, dramatised Bible stories, prayers and take-home activities. Unwrap one layer of a Christmas present each week! Explore the parts played by five nativity characters in the Christmas story and discover how we can reflect their gifts and attitudes today. Unpack one gift from a Christmas stocking each week! 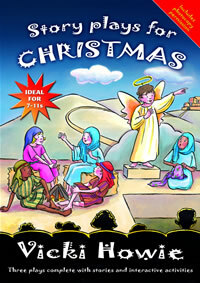 Link five key Bible stories from Creation to Easter to tell the great story of God’s love for us and to discover why we celebrate Christmas. Make a Christmas tree decoration from a gift tag each week! Find out how five nativity characters symbolise the people Jesus came to befriend and think about those God wants us to remember at Christmas time. 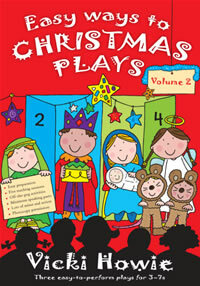 Includes photocopy permission on the dramatised Bible stories and craft template. Seasonal Activities for Christmas Festivities offers three five-week programmes exploring Bible characters and what their attitude to God can teach us, what incarnation means through the history of the Bible, and how we might respond to Christmas through social action. The usual games, drama, discussion points, crafts, and prayer suggestions are included; but I was particularly impressed by the introduction to each session, which had theological depth and perception. Those leading Junior Church on Sunday morning can sometimes feel that they are missing out on the adult learning. These introductions mitigate that, and in fact could form the beginning of a sermon series to run alongside the children's learning. I manage a small mixed age group of children in Sunday Club and we have just completed Programme 3 of Seasonal Activities for Christmas Festivities, entitled "The Gift of Christmas". Teachers and children have thoroughly enjoyed the programme and the tree decorations made each time from luggage labels was an excellent idea and within the ability of all the children. The Presentation at the end of the series sums all the teaching up and we will present it to church, who have thoroughly enjoyed hearing the children tell our vicar, after each session, about the homeless and lonely, the refugees and the meaning of God's Kingdom. that Christmas is Jesus's birthday. 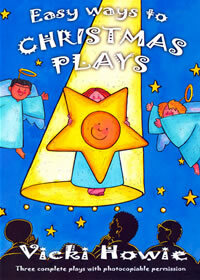 is about a fading star who becomes the Christmas star when he sees baby Jesus. is set in a village in Victorian times and features a small group of carol singers who discover the real meaning of Christmas one snowy Christmas Eve. 'Christmas' is the name of a dog that belongs to Luke, a boy who lives on the street. When the dog goes missing, Luke's friends search for Christmas in the festive city – and find him (and the true spirit of Christmas) in the church hall where hot meals are being served to homeless people. Planet Earth is dismayed at the unkind behaviour of humans and impatiently awaits the birth of Jesus. At long last, he feels the light touch of an angel's feet as Gabriel comes to set the nativity story in motion. This play is based on some of the Bible readings traditionally used at a service of nine lessons and carols. When Jesus and his cousin, John, meet each other as lively young boys on the long walk to Jerusalem one year, they discover that an angel had announced both their births. Sitting around the camp fire with their families that night, they persuade Mary and Elizabeth to recount the family stories. Each play is accompanied by a story version, drama games, a stage plan, a poster, ideas for costumes and four poems to perform within each play. Tom and Rosie's Godmother gives them an advent calendar to help them find out what advent is all about. They are surprised when an angel flies out of the first door with a message. But not all the pictures lead them to the nativity scene behind door 24. This play is set in St Nicholas Church in Oberndorf, Austria in 1818. The naughty church mice nibble the organ bellows rendering it silent for the special Christmas Eve service. So Father Joseph Mohr asks his friend and organist, Franz Gruber, to set a poem of his to music with a guitar accompaniment. Little do they realise that this simple lullaby will become a world famous carol.